Opening Day is a play on words. This is a morning painting though some may see it as the twilight hour. A day opens for me when the sun enters the sky. In the case of this piece it was all about how the very tops of the grasses received the first direct light of the day. The challenge for me was to get color and value nailed enough to make a believable image of the illumination of first light. I mix every color on the palette prior to application on the canvas and Opening Day was a good test of my color mixing skills. The sky was a mixture containing thalo blue, manganese violet, white and raw sienna. The middle ground was more of the same with different quantities of color. The orange grass by the small house had no blue in it but instead had more raw sienna and cadmium orange while using the violet to tame the high chroma of the mixture. I let loose on the foreground and kept my mixtures more high key so they felt closer to me than the middle ground. White was added to the right and glazed with a yellow tone in an effort to show a modulation in the grass. Also at play here was color temperature. 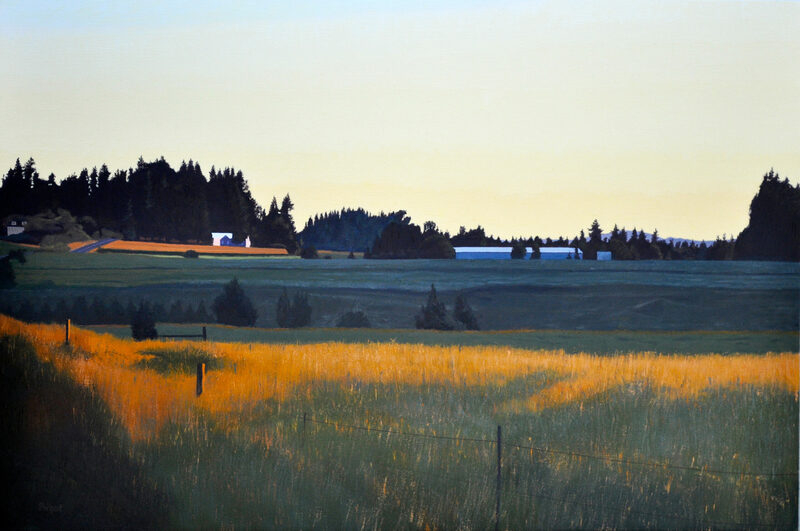 Both the middle ground and foreground are in shadow so in this case a touch of raw sienna was added (warm) to the foreground to make it visually come in front of the cooler middle ground. Middle ground mixtures had cerulean blue and viridian added to make it recede behind the foreground.